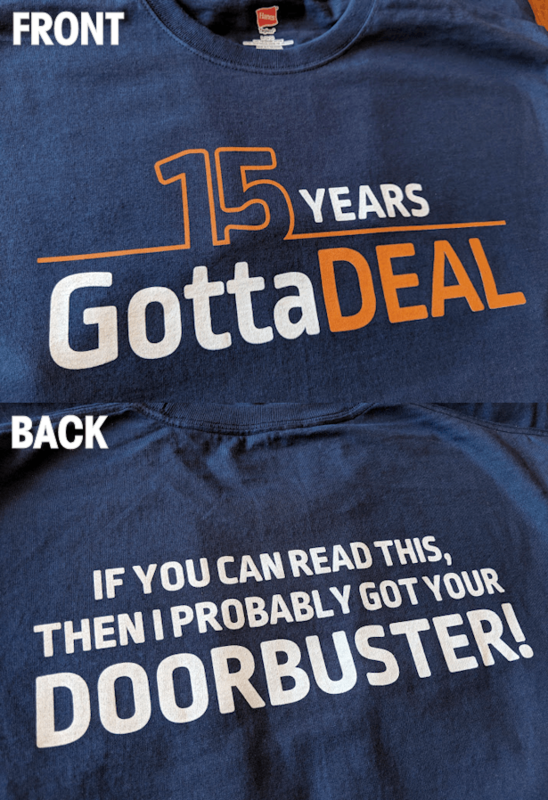 Order your GottaDEAL 2018 Black Friday t-shirts! Shirts are now sold out! You can now order our 2018 Black Friday t-shirts! You can pay with PayPal or with a credit/debit card. Shirts are $11 (sizes S-XL) and $13 (sizes 2XL-3XL). Shipping is included. Order as many as you'd like. Shirts are 100% cotton Hanes tagless navy blue t-shirts. Here is a measurement chart. And as always, we'll be giving away many t-shirts on the forum, Facebook & the webcasts (if they happen this year), but if you want to guarantee a shirt (or need more than one), this is your opportunity. The shirts we give away will most likely be limited to the most common sizes (L and XL), so if you want smaller or larger sizes, I'd suggest ordering them. On to this year's design... the front features a logo commemorating the 15 years GD has been open and the back of the shirt brings back our very popular "If you can read this..." tagline which we haven't had on a shirt in 4 years. Shirts will ship in batches throughout October and November, but will arrive in plenty of time for Black Friday. Awesome shirt, I LOVE the saying on the back (Thanks for adding it back on this year). Just ordered one for my daughter. My sister and I are locked in thanks to the t-shirt club. Gearing Up! Hoping I win one soon!!!! Just an update: all paid shirt orders have shipped tonight, along with prize shirts assuming you contacted me before today to claim your prize. Next batch will go out at the end of the month, so place your order if you want to be included. I work entirely too much!! I've been saying I needed to get on here for a month and today is the first day I have. BUT I got my shirt ordered!! I love the shirt! Win one or buy. Decisions, decisions. Buy, then win a spare! Just a heads up, I'm already running low on sizes small, medium and 3XL so if you want a shirt in those sizes, I'd strongly suggest ordering ASAP. There's a good chance some of these sizes could be gone by the time the next contest ends and we may be left with only sizes L, XL & 2XL for future contest winners. I still have the option of placing a second order with the printer but it will depend on how many orders I get over the next week or so. Another shipping update. Later today I'll be dropping off more shirt packages, so if you've won a shirt or bought one as of right now, yours will be on its way if it wasn't part of the first batch. It's looking like future contests could likely be limited to XL prize shirts only so keep that in mind. Sizing update: as I predicted, I am now down to about a dozen XL shirts left. All other sizes are gone. The remaining shirts are available for purchase for another week or so. Thanks to everyone who bought shirts this year - you (and the t-shirt club members) cleaned me out much earlier than anticipated. It's tough to predict demand and size ratios each year. Might look into more of a print-on-demand setup for next time but I don't want prices to be much higher than they are. Just seen I am out of luck for ordering a T-shirt for this year.